… so in honor of the fast approaching Valentine’s Day “holiday,” which some dread while others flock to the cheesy sections of the store marked accordingly; i figure that every so often i will add my thoughts to the those existing about love, friendship, rings, romance, etc. this is more of an amusement for my brain than anything else. oh, and of course, there will be blood- oops, i mean poetry. while i thought i would begin these series of blogs with a poem, i figure i would begin with a mention of what i have found online. next week will no doubt find me in the realm of Wal- Mart, shrine to all that is cheap “in theory” and not made in America, but that’s another story. So, i thought that since I would be cutting a blaze through such terrain and would be in need of some Valentine’s Day goodies, i would check out what they have online. Perhaps, they may have something modest but heartfelt that I can bestow upon my new “fly honey,” so to speak b/c I’m not sure what to call us quite yet. 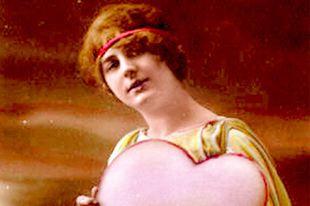 (Also, see other blog I wrote about Valentine’s Day in which I lament over what the hell to get him- I still don’t know). “Sleep”wear- we all know this is a joke b/c seriously, who stays in sleepwear long on Valentine’s Day, much less any day it’s worn… btw, I am referring to when it is worn when a romantic party or otherwise, is present.